LOCATION: Clarksburg, MD, relocated to Hagerstown, MD. SPEC: 9M C-band FMA, 14M C/Ku-band FMA, 19M C-band FMA. 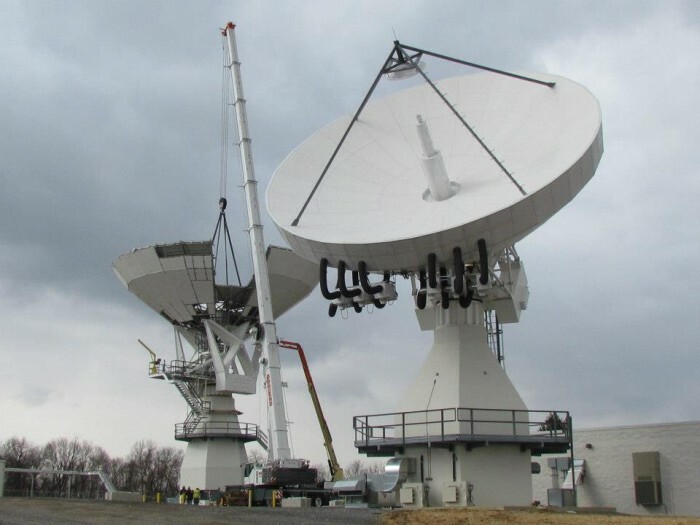 PROJECT SUMMARY: Mechantech was contracted to relocate and refurbish three Full Motion Antennas from a decommissioned Clarksburg MD site, to the newly commissioned Hagerstown MD facility located ~50 miles away. The project included refurbishing or replacing all major antenna drive components, as well as converting the de-ice system from electric to W.B. Walton LP heaters while maintaining 0 – 90 deg full range of elevation motion. For the 19M antenna, we also relocated the high power amplifiers from the antenna platform to the base of the antenna tower. © Copyright 2016 Mechantech, INC. The Mechantech logo and the name Mechantech, are the property of Mechantech, INC and may only be reproduced with the express written consent of Mechantech INC. All rights are reserved. All other logos, marks, trademarks, service marks, services, product and/or company names that appear as a result of your use of this website or any third-party hyperlink remain the property of their respective owners. The use of this site is governed by the Terms and Conditions and Privacy Policies and any use by you of any third-party website is governed by the terms of the third-party website. Powered by MECHANTECH | E:T.